CosFest is Pacific Media Expo's cosplay masquerade! See an extravaganza of amazing costumes, great skits, and special performances. Costumers are encouraged to participate in the show, and everyone is welcome to attend! CosFest will be held on Saturday, November 13th. Participants are eligible to win a variety of awards and CASH PRIZES!! Scroll down this page for links to CosFest event rules, participant form downloads, and frequently asked questions. Make sure you read the event rules before signing up. Click here to go straight to the participant rules & guidelines. If you have any questions, feel free to contact the CosFest manager. Online event registration is now closed. However, we will be accepting at-con sign-ups in the CosFest Lounge (Pacific Ballroom B). Angel Hearts is an American cosplay group based in California that specializes in idol-pop song and dance routines. 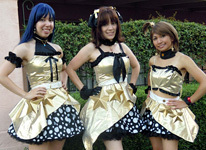 They have been doing IDOLM@STER, ParaPara, and J-pop performances at anime conventions throughout California since 2003. For CosFest they will be dancing to songs from the Japanese idol simulation game, THE IDOLM@STER. Mikarin has been playing piano and singing her whole life; in fact, music is what brought her from Japan to Los Angeles. After focusing on her music very intensely for a long time, she began to get homesick. She decided to go to a local video rental shop to look for a Japanese movie to rent. While there, she noticed that they had Anime movies, so she rented one. That opened the gate to her Anime OTAKU life. Being an artist from the beginning, she was naturally attracted to cosplay and making her own costumes. That was the birth of Takeriya Samurai, the cosplay team of Mikarin and Hagi. Having spent most of the past four years exploring sewing and craftsmanship techniques, Mikarin is now focusing on integrating her expressions of music with that of costuming. At this year's PMX CosFest intermission, she will perform four of her favorite Anime songs, which represent the four seasons. Mikarin's presentation will be in Japanese with Hagi translating. Any genre of cosplay is allowed in the halls, but costumes must be suitable for all audiences. Pacific Media Expo is a family-friendly event attended by people of all ages. Please keep this in mind when designing and choosing your costumes, and allow your common sense and good taste to prevail. Pacific Media Expo reserves the right to deem a costume as unacceptable and request the wearer make modifications as necessary. Refrain from obscene gestures and displays. Respect the personal space of other attendees. Do not hug strangers without permission. Absolutely no glomping or inappropriate touching. No "horseplay" (unruly physical behavior that might injure other people or damage property). We encourage all attendees to be creative and have fun, but having fun does not require leaving one's maturity and social propriety at the door. If you experience harassment from other attendees, you are welcome to report it to PMX Security. Whether you're competing for the first time or have a long history with competition, it's always possible we are doing something different than you might expect. It is your responsibility to read the rules and make sure you understand them. If you have any questions, please don't hesitate to ask the CosFest Manager. Check here to see a current list of entries that are registered and approved for CosFest 2010. The CosFest Lounge, located in Pacific Ballroom B, contains the CosFest masquerade function desks as well as a photo studio! The Photo Studio is open to all attendees. Cosplayers and fashionistas are welcome to stop by during available studio hours and pose against a professional backdrop. Take photos with our studio manager, or bring your own photographer! We also highly encourage costumers to hop over to the masquerade desk and sign-up for the contest! We accept at-con sign-ups at any time on Friday or before 1pm on Saturday. Check this article for open hours! Please note that this is a sample document and the judging process may not include everything listed below and/or the judges may decide to add to the following questions and observations. We will compare your costume to the picture or pictures that you provide for us to note accuracy, theme, originality, etc. Want to know about the judging scheme and the awards going out? Check here for explanations and prize figures!